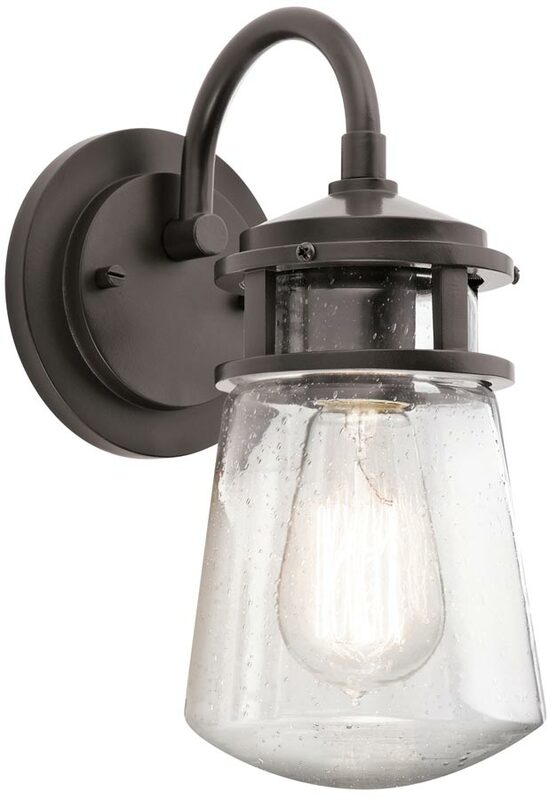 This Kichler Lyndon 1 light small outdoor wall lantern in architectural bronze finish with clear seeded glass shade is rated IP44 and features updated traditional period style. Boasting a circular wall mount, swan neck arm and small downward facing lantern, with sloping roof, detailed shade mount and flared clear seeded glass shade containing a bare lamp bulb. Add a bit of traditional charm to your exterior lighting with the Lyndon collection, which combines a simple streamline design with an emphasis on classic details. Featuring a beautiful architectural bronze finish and clear seeded glass, this fixture can effortlessly blend with your existing décor. If you are searching for quality lighting in a traditional style, this small outdoor wall light should be considered. Fully weatherproof and supplied with a manufacturer’s 3-year anti corrosion warranty, which relates to the corrosion of finishes on exterior lights like this one. Locations within 5 miles of the coast are excluded. There are matching fittings in the Lyndon outdoor range that includes a larger wall lantern, a hanging porch light and five light outdoor chandelier; please see below for the complete collection. This exterior light is supplied by Elstead Lighting and designed in the USA by Kichler who were founded in 1938. They design beautiful home lighting products featuring award-winning craftsmanship and unparalleled quality, such as the Lyndon 1 light small outdoor wall lantern in architectural bronze finish with ribbed seeded glass shade you see here. Yes, either our 5w or 10w ES dusk to dawn LED lamps are compatible with this light fitting.